When my nephew was a toddler, say about 2 years old, I had a surprise. One weekend I came to visit and he sat down with a book and started reading. I asked my sister and she told me that he memorized the book, and he still can't read. I'm rather a bit past that with Spanish now. I don't skip over the Spanish Stations on the radio when channel surfing. I have noticed that "Love Songs" are becoming more clear to me and I can actually follow them along ... somewhat. I can watch kids TV and follow the discussion and actually get the jokes most of the times. I mean, after all, we're talking kid's shows. Plaza Sesamo and Franny and her demented feet. At least in what I jokingly call "Native Spanish". Franny is a Canadian Production and the first time I heard it in English, they all had bad British accents. It sounds better in Spanish to me. I challenge myself with the animal documentaries because of the slower pace of the dialogue. I have always enjoyed documentaries, even when I was a wee brat. Watching a documentary on the forests of Madagascar in English is something I'd do normally, let alone En Espanol. Sorry, I don't have the "enya" key. You know, English Speakers, the n with the funny squiggle over top. Oh, and the accents En Espanol mean something. I never figured them out in French, but in Spanish it is a "stress" mark. You stress that syllable. Very logical system of spelling, everything means something, and it has been rationalized and normalized to be predictable. Unlike English where Ghoti could be pronounced as Fish. I've heard people do this all the time. When learning a language, they will seek out media of that language, and pay attention to it. Many people have said that they watched Telenovelas to learn Spanish, Cartoons for English, and so on. I'm doing nothing new here. I am certainly not splitting the atom. Although, when I'm sitting in bed listening to the shortwave radio at night, and I find myself listening to a broadcast, I'm not exactly expecting to be switching back and forth between Radio Marti and Radio Reloj. That particular programming shift is about as broad a shift as you can get, other than perhaps switching back and forth between South Korean and North Korean broadcasting. They are, however, very easy to find here in South Florida. Specifically, Radio Marti is the US Government's programming that is "designed" for Cuba. I suspect it has an intended effect of being designed as a knock on effect for Venezuela. Whether it is effective or not, I will let others decide. Radio Reloj is literally "Clock Radio". It's out of Havana, Cuba, and I can hear it here on the AM radio even if I don't try too hard. Being a Cuban National Broadcast, it's probably as balanced as any Cuban broadcast, which is to say about as balanced as Fox News or Radio Marti. I'm listening to things specifically to learn the language, not for "information". I will say both services are less "shouty" and "strident" than they had been in the Cold War. 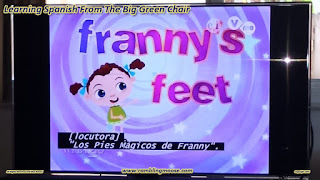 For the most part, it's better to stick to Plaza Sesamo, Franny and her weird feet, and the documentaries. Political Intrigue and Propaganda are a bit much when your level of comprehension is about 1/2 the way there. More importantly though, it does one interesting thing. It opens up a whole new world. Actually a continent and about a half, but it does open it all up. If my learning methods are up to the task, that is. After all, if you can't learn Spanish in South Florida, you can't learn Spanish anywhere. So turn on the TV, turn on the closed captioning, and put on some kid's programming. The Closed Captioning make it much easier to grasp since you are reading at the same time as hearing the words. The simplified sentence structure and subject matter will help as well since there are fewer Big Words. I'll try to remember to leave the politics behind. After all, I'm not quite ready for that, although a nice documentary about a lizard habitat would be rather enjoyable today. But if you are considering learning another language, and are just starting out, try Duolingo.com and pick your language. The simple lessons get gradually more complex, and you can set your goals as low or as complex as you like.